MISSION, KS--(Marketwired - May 15, 2017) - (Family Features) Cute as kittens are, kitten season often emerges as one of the most challenging times of the year for animal welfare organizations. Some experts estimate as many as 20 million kittens are born in the spring. That number of kittens is twice the number of people living in New York City. 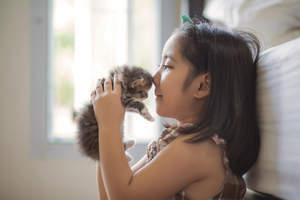 "This time of year, the need for finding adoptive families for kittens and cats increases exponentially," said David Haworth, DVM, Ph.D., and president of PetSmart Charities. "While kittens tend to find homes very quickly, adult female cats, especially those that are about to or have just had a litter, are often abandoned and they're in need of forever homes, too." 1. One female cat can have up to 100 kittens in her lifetime. Cats can become pregnant at just 5 months of age and can have up to three litters per year, with each litter ranging between one and eight kittens. That's why most adoption programs offer cats and kittens that are already spayed or neutered, as well as being veterinarian-checked and vaccinated for common diseases. 2. Cats are great communicators. Cats make more than 100 different sounds, but they only meow to communicate with humans. To communicate with another cat, they will most often purr, hiss or spit. 3. There may be healing benefits to purring. Most people think cats purr because they are happy, but cats also purr when they are nervous and sick, too. Veterinarians like Haworth believe cats use purring as a self-soothing method that may even help them heal. The frequency of the vibrations caused when a cat purrs is the same frequency that promotes increased bone density and muscle restoration. 4. Cats can be righties or lefties. Like humans, cats have a dominant paw. Most female cats prefer using the right paw, while male cats are more likely to be lefties. 5. Adoptive cats and kittens bring many rewards. When you adopt, you literally save a life. Plus a free adoption kit available through PetSmart gives tips to help integrate new pets into the family and has more than $475 in free items and discounts on pet essentials and services. The retailer is also donating a meal to a pet in need for every bag of dog or cat food purchased online or in stores through the end of the year through its Buy a Bag, Give a Meal program. The food is then distributed to shelters and food banks across the U.S. through partners Rescue Bank and Feeding America.